The ULISSE COMPACT HD is an IP66 Full HD network PTZ camera that delivers excellent high-definition picture quality. 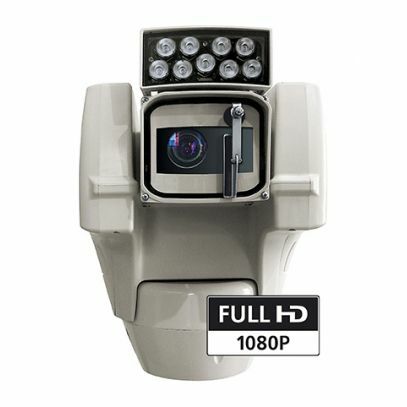 The Full HD camera integrates a 30x optical zoom lens and is able to accurately identify specific details of a scene. The flexible operator control of Pan/Tilt/Zoom functions allows the images transmission over Ethernet with H.264/AVC and MJPEG compression, certified ONVIF, Profile S. This HD PTZ camera can deliver from 2 to 4 H.264/AVC or MJPEG streams simultaneously, up to a total of 20Mbits depending on the unit configuration. The ULISSE COMPACT HD response to operator commands is immediate. The Videotec's PTZ ASSISTANT plug-in software supports any VMS with the control of all special functions such as wiper, washer pump, IR and Auto Focus. Furthermore, the de-fog feature allows clearer and natural viewing in foggy or misty scenes; when activated, the camera detects the haze level and automatically applies the required effects. ULISSE COMPACT HD withstands harsh external environments, ensuring high speed and accurate target detection at any time, with zero maintenance. Thanks to its robustness and accuracy, this PTZ camera unit is the ideal solution for demanding security applications, including: traffic and highways control, stadiums, industrial surveillance, prisons, military installations, borders and perimeter surveillance.